U.S. President George W. Bush prepare to pose for a group photo during the Summit on Financial Markets and the World Economy at the National Building Museum on Nov. 15 in Washington, DC. 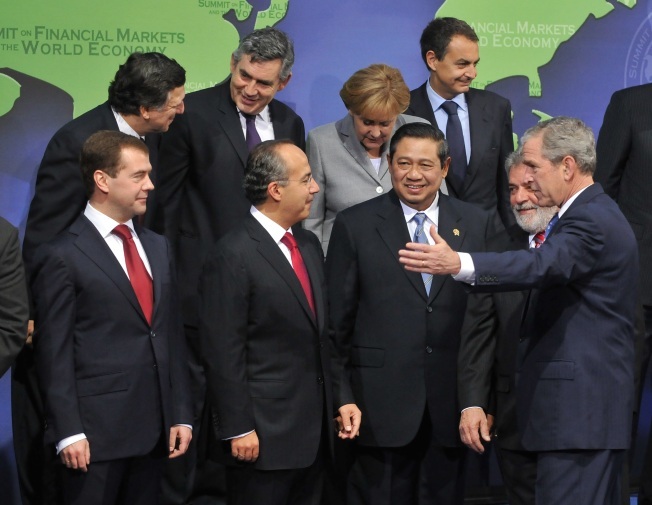 Twenty world leaders are gathered at the summit to address problems currently impacting the global economies. With coordination between leading economies effectively on hold during the American presidential transition, little was accomplished at the much-hyped summit of world leaders last week besides passing the buck to incoming president Barack Obama. "I don't think the G-20 summit changed anything," Berkeley economist Brad DeLong said in an e-mail. The Group of 20 will reconvene on April 30, Obama's 101st day in office. With the economic landscape giving way underfoot, the new president will have little time to fashion the policies that may well determine the success of his presidency. To date, Obama has provided few concrete details on how he will tackle what's become a worldwide economic crisis. A clearer picture should emerge when the president-elect announces his picks for Treasury secretary and other key economic posts. Obama, though, should arrive at the April summit of the group, a collection of the finance ministers and central bank heads of 19 of the world’s largest economies (the European Union is the 20th member), in a position of strength, Simon Johnson, a MIT economist and former chief economist of the International Monetary Fund, told Politico. Congress appears poised to enact a sizable stimulus package quickly after Obama takes office Jan. 20, and the new president is also likely to take more aggressive action to combat the ongoing mortgage foreclosures, which some experts say is needed to begin turning the larger economic crisis around. His Treasury Department may also begin allocating the second half of the $700 billion bailout. That spending should allow Obama to ride into the April summit and essentially show that "America is back," said Johnson, who is also a senior fellow at the Peterson Institute for International Economics in Washington, D.C.
That summit is slated to take up the idea of nations’ coordinating monetary policy — intended to avoid a repeat of the sometimes competing policies that emerged as a crisis that began in the American real estate market spread across the world’s markets — and of a new global regulatory body for financial markets. While Europe has pushed for both these moves, President Bush has successfully resisted the changes, and it’s not clear in any event that a commitment from the outgoing head of state would have satisfied those seeking them. Obama has yet to signal his position. Brookings scholar Colin Bradford, a former chief economist at the U.S. Agency for International Development, says he tells people from other countries that with Obama, as opposed to Bush, "you know you're not going to find a guy who's sort of sucking his thumb and doesn't know what to do." But with the global economy expected to worsen in the intervening months, Obama will face tough decisions, and possibly depleted domestic political capital, by the time the G-20 reconvenes. "The loop we're in now, if we don't find a way to get America to go back shopping, to get a catalyst there [for the economy], Barack Obama could have some of his inaugural balls in soup kitchens. I mean, I don't know where this is going to be a couple of months from now," New York Times columnist Thomas Friedman said Sunday on "Meet the Press," looking ahead to the uncharted depths of what started as a credit crisis and then morphed into an equity and consumption crisis and now an unemployment crisis that is in turn intensifying the credit crisis. Steven Clemons, director of the American Strategy Program at the New America Foundation, took a different view, warning that government action intended to restart the consumer habits that created the crisis would only worsen it down the road. Last week’s summit's attention to changing the global financial architecture "is still inadequate and does not solve the fundamental tectonic problem of there being too few alternatives to the American consumer as a global consumption engine," he said in an e-mail. "There must be steps initiated — as China has recently announced — to stimulate consumption demand elsewhere in the world. We can't go back to old habits of underproduction and overconsumption in the United States." Clemons dismissed the summit as “dismal … virtually nothing but a soporific commitment to future cooperation." Not everyone was so disappointed in the results of the summit hosted by the outgoing president, which was widely expected to produce little substance. "The declaration was far more detailed and substantive than commonly expected. It lists many changes that should be carried out by the G-20 members in the very near future — by March 31, 2009 — with more to be done over a longer time horizon. If these objectives are actually accomplished, the landscape of global finance will be radically altered, for the better," said Gary Hufbauer, an economist with the Peterson Institute, in an e-mail to Politico. And contrary to analysts who expressed disappointment that there was not a firm coordination in the area of fiscal stimulus, Hufbauer was pleased by what he saw as a "general commitment to use large doses of fiscal stimulus by countries that can afford to do so." Moreover, the statement held some words on the global trade that are being cheered by pro-trade advocates. The document committed the G-20 to kick-start the stalled Doha round of global trade talks by the end of the year and affirmed the need to reject protectionism. Of course, so far it is all just words. "This could all turn out to be hot air," Hufbauer said. Obama "will have to be fully on board for this agenda to be implemented, and lots of eggs will need to be broken among all the national regulatory agencies, congressional and parliamentary committees, etc., before any sort of meaningful financial omelet can be cooked." Obama kept his distance from the summit, keeping a clear demarcation between himself and outgoing President Bush and avoiding taking ownership in the financial meltdown. "The outcome of the weekend G-20 summit reflects the wisdom of Obama's 'one president at a time' decision" to not participate in the summit, said Stephen Hess, a former staffer in the Eisenhower and Nixon administrations and a scholar at the Brookings Institution. "The summit did all it could do at this time. Obama's involvement would have created misunderstandings and even confusion. While this may seem obvious now, it was far from obvious from the media's (and some economists') desires immediately after the election." Hess said Obama's involvement "would have had to make more hasty decisions on personnel and policy. Having been involved in transitions since 1960, I see — and have seen — more danger than value" in participating in such a world meeting during the transition, Hess said. In his place, the president-elect sent former GOP Rep. Jim Leach and former Clinton Secretary of State Madeleine Albright. The pair met with delegations to the G-20 summit from Argentina, Australia, Brazil, Canada, China, the European Commission, Germany, India, Italy, Japan, Mexico, Russia, South Korea, Turkey and the United Kingdom and with the secretary general of the United Nations. They also spoke with the French delegation via phone. Leach and Albright will brief Obama and Vice President-elect Joe Biden on their conversations.